Remember getting out of a hammock and having a giant imprint of a net all over your body? I loved lying in a hammock as a child, but hated the net imprint. Your skin would pop out of the holes and pinch plus I always worried that my knotted rope may give way and I would come crashing to the ground (it happened more than once). In my young adult years I steered away from setting up hammocks while camping, mostly because of my childhood experiences. 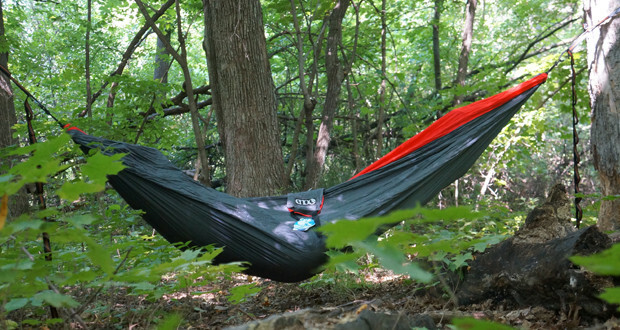 After trying the ENO Doublnest two-person hammock I can say I am officially in love with hammocks again. 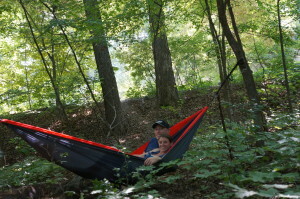 This is a great two-person hammock! My previous net hammocks, were fairly small but didn’t come with a package. We usually just tied the hanging string around it to keep it from coming apart. 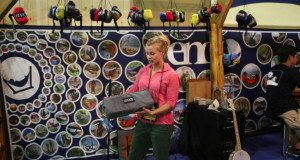 When I first saw the ENO in it’s bag I was impressed with its small size and furthermore with its sleek presentation. It just looks cool. The outside of the bag is a great nylon material and is super small, probably about the size of a football. It also comes with a small bag that houses the suspension materials. With it being so small it is a no brainer to throw in the car for camping. 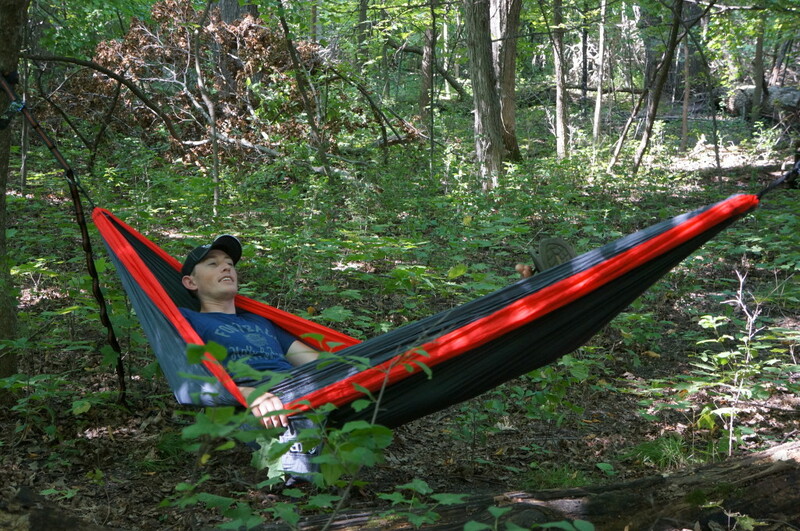 Hammocks are perfect for relaxing at the campsite and are also entertaining for kids. 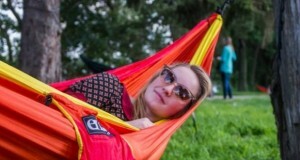 Like the bag, the hammock itself is made out of the very comfortable nylon material. 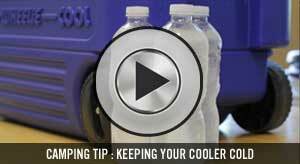 It gives a cooling, breathable effect that feels good on your skin. Kind of like when you upgrade to a higher thread count bed sheet and realize the comfort you were missing out on. I wasn’t sure what to expect when taking the two-person hammock out of the bag. My first thoughts were, where will I set the bag it came in?, how long will it take to set up? and how is this really going to fit two people? All of those answers were answered quickly, to my amazement. As I started to empty the bag the hammock just kept, coming and coming. 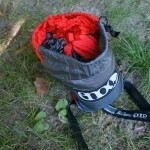 I realized the sack is a handy compression bag, which is great for keeping large items in small quarters. 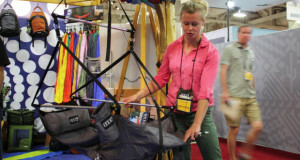 Plus it stays attached to the tent so you don’t have to worry about misplacing it. I was impressed with how large the hammock truly was. The real test for me was how long it took to set up. Let’s face it, having a hammock at your campsite sounds great, unless it takes 20 minutes to set up then it doesn’t seem that relaxing. The ENO Doublenest set up in about 3 minutes and that was with us reading the directions! In the separate bag are the suspension straps that can go around almost any sized tree. Just throw the strap around the tree and pull it through the loop. 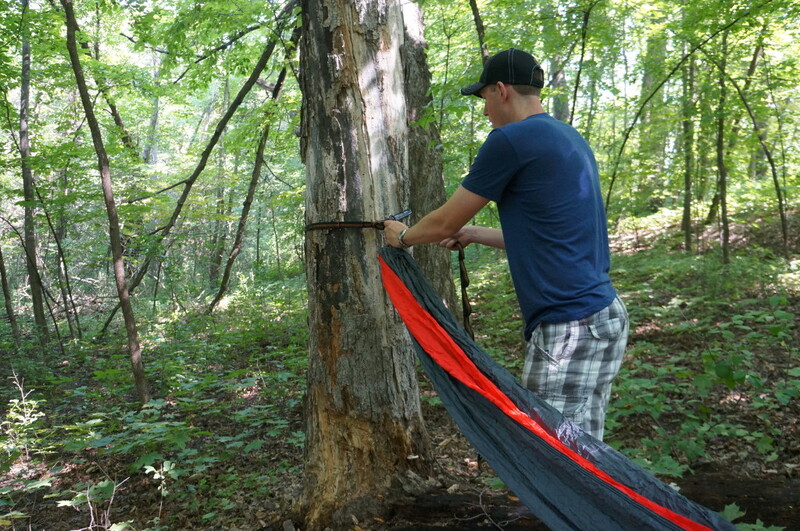 There are multiple loops depending on tree size and allows you to adjust how far off the ground you hang. I thought this was a genius idea! Once set up, it was time to get in. I got in solo to test it out and the first thing I noticed was the material. The nylon is so soft and inviting, providing an encompassing feeling. 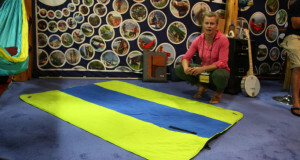 This nylon material blows all old net hammocks out of the water and would even give bed sheets a run for their money. The ENO was something I felt I could lay in and truly relax for hours. After a few minutes I was joined in the hammock to see how the Doublenest handled two people. I was pleasantly surprised at how much room I still felt I had with two adults in the hammock. 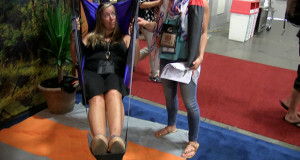 Plus it is rated up to a 400 lb capacity so you never have to worry, is this thing going to hold me? This hammock really is great for car camping; whether you want it just to relax, take a quick nap or even sleep in. 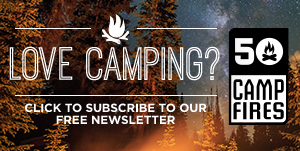 Eagle Nest Outfitters has a ton of accessories you can get for the Doublenest such as an insect shield, guardian bug net, hammock repair kit or PakPillow. 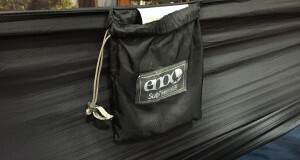 At under $70 the ENO Doublenest is a great hammock for the family camper.